The incredible history of Spain and the Iberian Peninsula includes conquests and settlements by the Phoenicians, the Carthaginians, the Greeks, and the Romans. The Romans built permanent colonies all over the peninsula, and they later named the region Hispania, from which the later Castilian Language term España was derived. Following the Germanic invasions, after the fall of the Roman Empire, the Iberian Peninsula became a patchwork of Gothic kingdoms. In 711, the Moors, from North Africa, occupied the Southern half of the Iberian Peninsula, where they would remain until 1492. Finally, in 1492, the Moors were driven from the Iberian Peninsula, and the Kingdoms of Castile and Aragon merged together to form the Kingdom of Spain. Something else happened in 1492, which would change the future of Spain forever. A Genoese explorer by the name of Cristoforo Colombo (Spanish: Cristobal Colon, English: Christopher Columbus) appeared at the court of King Ferdinand II (of Aragon) and Queen Isabella (of Castille). Columbus' proposal was to find a short-cut to the Orient, by sailing Westward across the Atlantic Ocean. During Columbus' four voyages, he never found the Orient, but what he did find would change his world forever. Columbus had discovered portions of two vast continents, occupying the entire Western Hemisphere of the Earth. Within a few years, this discovery catapulted Spain to the status of the World's first great colonial empire. Spain's colonial achievements, in what would become known as the New World, have left a modern legacy, best illustrated by the fact that Spanish is the World's third most spoken language today. With a historical legacy like this, there are, of course, a multitude of people, places, and events to celebrate on the commemorative stamps of Spain. Collecting the classical definitive postage stamps of Spain offers many opportunities for both the specialist and the general collector. The complexity of the early definitive postage stamp issues offers an immense challenge for the specialist, with many printing, paper, and cancellation varieties. The progression of the many types of definitive postage stamps of the later 19th Century through the early 20th Century also reflect the political and social turmoil occurring during those times. 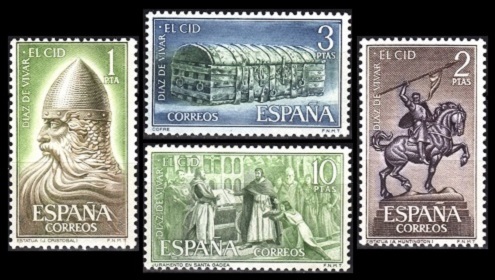 The later commemorative stamp issues of Spain offer the more casual collector endless hours of enjoyment, for a modest cost. The later commemorative issues also offer the thematic collector a large number of interesting topical subjects, including history, archeology, castles, ships, churches, monuments, famous people, costumes, and works of art, to mention a few. 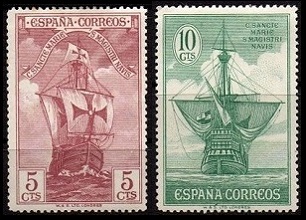 Links to historical articles and reviews of each of the individual classical and early modern postage stamp issues of Spain will eventually appear at the top of the third column of this page.